The first time I visited this region, I paid little attention to the flora around the house. It was green. 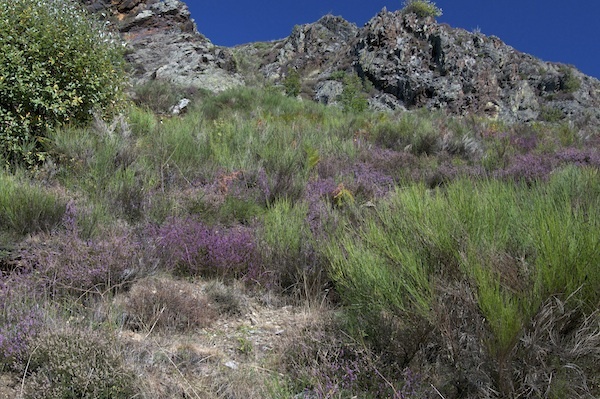 The second time I came, I noticed that, lining the long driveway to Montplaisir, were hundreds—thousands—of bright green heather shrubs. All native. Many more than a metre tall. It being September, none were in bloom, as had been the case before. 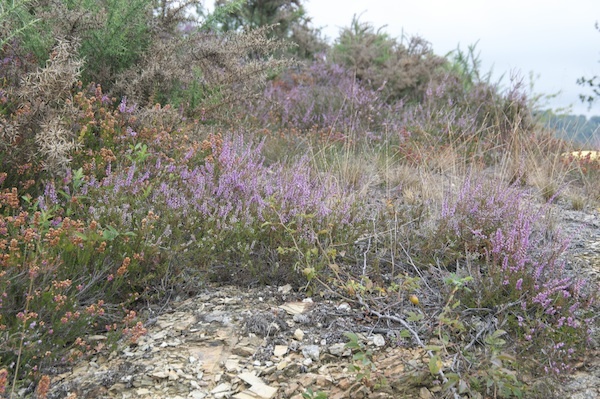 This visit to France, we went first to the Tarn, where heathers were in bloom. Being slightly further north and with a slightly different climate made the difference. When we moved on to the Mirepoix area, heathers, again, everywhere. This time, I was able to identify that at least two varieties grow around here: the bright green, tall kind, and a lower, leggy, dark kind. On one trail, the tall variety was blooming: greeny–yellowy–white flowers, rather typical of the heath-tree flowers one can see in Victoria. Then we too a day trip down into the Pyrenées to Axe-les-Thèrmes. The hillsides above Axe and below the fresh-snow–covered peaks were aflame with fall colours and bloomin’ heather.